Having just missed out on the podium with a fifth-place finish in the first event at the Nürburgring, Marco Wittmann finally reached the rostrum in Sunday’s second DTM race. 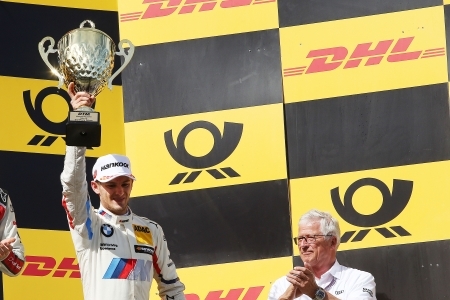 Starting from ninth place, the 2014 and 2016 DTM champion gave a near-perfect chasing performance in his BMW Team RMG’s home race and claimed third place in the overall standings. Wittmann was able to move up a place right at the start. He then continued to work his way through the field. The Franconian driver benefited from an incident between his team-mate Timo Glock and Mercedes driver Lucas Auer. From fourth place just a few laps from the end, Wittmann was able to overtake his BMW colleague Bruno Spengler. Wittmann then attempted to catch the two drivers still ahead of him but had to be content with third place – a more than satisfying result for the BMW driver. The competition continues in just two weeks, when the DTM enters the home stretch with the penultimate race weekend of the season at Spielberg.